Employers are the ones who come up with the best ideas for their team. There are a number of reasons for bosses who do not listen to your ideas. Though you come up with creative ideas, bosses think it’s a risk and step back from implementing them. Turn your idea into a successful one and make your boss listen to it following a few strategies. Use a few tips so that your idea is heard and implemented by your boss. Let’s glimpse through a few inner details about how to convince your boss listen to your creative ideas. When you’re ready with a creative idea, make sure to choose the right time and place in order to get your boss to listen. Avoid surprising your boss when he is at a busy meeting, instead, you can make a plan well in advance to meet outside and also make sure that the environment is supportive and focuses on your goals. Your boss’s schedule might be packed but make sure to find some time and also collect your necessary requirements to present your output to your boss. If you’re unaware of the idea and intention of your boss regarding the output of the work, ask your boss about his desire regarding the same. Bring out ideas that align with your boss’s ideas. By this way, he would be ready to hear your idea and may implement it, if it’s perfect. Formulate a well-designed presentation and give an outstanding one. There are employees in an organization who always think creatively but often get rejected by the boss. It is important to remember that ideas are usually vague and hence one should make your boss understand the competing idea with the help of a prototype. You may make use of visualizations and customer journey so that you offer a clear understanding to your boss. Your boss would believe only when they see it hence make sure to present them a model or an example. By this way, they will listen and accept to your creative ideas. When an employee brings in new and creative ideas, he must make sure to check for all the issues that arise. If there are issues that arise due to the idea, the employee must also possess a solution for the same. By this way, the boss would listen and accept your creative ideas. An organization usually works to achieve company goals, so when employees present ideas that are associated with company goals then the boss would definitely listen to their creative ideas without fail. Your creative ideas can be to enhance productivity, attract in more customers and a lot more. Your boss would listen to your creative ideas when your idea benefits your boss in some way. When your idea is presented with beneficial facts like these, it would surely make your boss happy and make him listen to your idea. You may be an employee who has the best creative idea in the universe but if you do not have proper planning in delivering the idea to your boss then you may result in failure. Hence, figure out the way to make and present your idea rather than orally explaining it. By this way, you not only make your idea grab your bosses attention but also see your idea being executed. Bosses usually like employees who are challenging, enthusiastic and interactive. Interact during your presentation so that your boss is well engaged and has longer attention. For silent and reserved bosses make sure you are lively. Always remember to put your boss at ease, and make sure that the materials you use are attention-grabbing. There are employees who flash out their knowledge and try to share it when they are offered with a chance. It is always good to do your homework before you blurt out your excellent idea. When you have not done your homework and present, your plan may end up with a mess and may not impress or convince your boss. When you present an idea make sure that you learn more details and have an inner idea about the same. As an employee, you should be prepared to answer all the related questions and hindrances that come from others. It is beneficial to be prepared and have better chances for an optimistic response. Your idea should be a creative one that impresses and benefits the customers too. Show that your idea benefits the customers a lot. Associate the customers to your project and let them examine your prototype and understand the useful factors. Record the customer’s reviews and present it to your boss by which he would listen to your creative ideas. Any creative idea or plan cannot be implemented individually in an organization. When a new idea is to be implemented more support is required in the organization in order to survive in the corporate culture. Support is required from R&D engineers, service people, production managers, salesmen, financial controllers and IT staff. It is hence advisable to start your innovative idea with a team and also remember to make your boss a part of the team. When the idea is innovative he listens and also becomes part of the success. Apart from presenting your idea to your boss, it is equally important to pick the right time for your ideas. The time should be in a way that your boss listens to your creative ideas at that moment. For example, when the team initiates something that requires the process, then bring in your new creative idea so that your boss accepts and not when some project suffers. When you’re presenting your idea to your colleagues make sure to ask the people around to partake in the presentation. Your boss is one amongst them and would be attentive in that manner. Always stay focused and do not fear to take control as your boss is present there. By this way, your boss would accept and listen to your great and creative ideas. In order to grab the attention of your boss about your creative ideas and others, make sure to bring out your ideas in the form of a story. Make your presentation interesting so that everyone has the intention to listen to it. Start the idea with the issues that your boss faces and move on with solutions, and also explain how your ideas will improve productivity. By this way, your boss would listen and accept your creative ideas. Once you have mentioned your idea to your boss, he may take the time to consider the same. There are audiences who have been taking notes till date in many presentations, in such scenarios make sure to distribute notes to the listeners so that they can be referred later. A simple sheet with the key points can be one idea that may impress your boss with your creative idea. 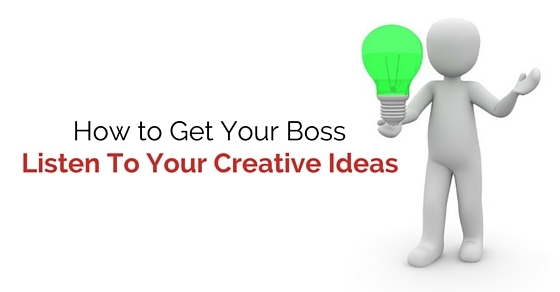 These are a few tips which can be followed in order to impress your boss and make him accept your creative ideas. Employees who develop innovative ideas should also know the other part of how to take it to their boss and make him listen. Employees who are filled with innovative ideas and want their boss to listen to them, can run through the few points mentioned above. All these aspects are beneficial and would surely help to raise and implement your creative ideas with your boss. The employee should try to make impressive presentations which engage the listeners and also lure and convince your boss. Powerpoint presentations are the best choice which assists in keeping things varied, the employee should take efforts to use pleasing texts and present the creative idea so that the boss is impressed. Whatever idea is put forward make sure to keep the audience and their perspective in mind. Any creative idea should be generated for the welfare and development of the company. Bosses would be impressed and listen to ideas that are useful for the organization in all ways.